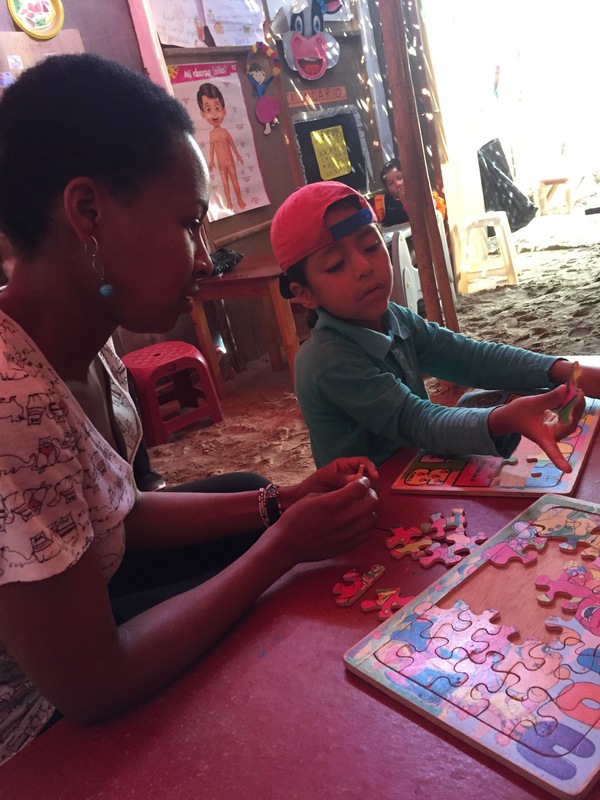 Early Childhood programs in Chimbote are community supported with the teacher’s salary supplemented by the state. Because of this, the classroom environments vary greatly. WGC in field staff, Selena visits a few of these programs regularly. 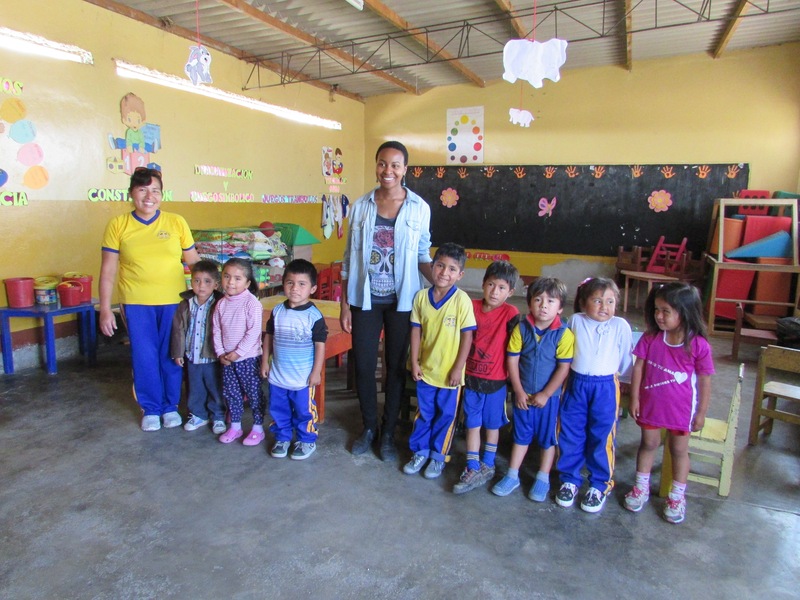 She provides demonstration lessons and works directly with children. On Tuesday and Wednesday she took us to two of these classrooms. The first was a 30 minute walk from her home in Chimbote, from the busy city streets into what becomes the campo, farm area. The classroom has walls and cement floors. It is attached to a primary school. The teacher Mari regularly has 12-14 children. But we are in the last days of the school year, so few were in attendance. The children were happy to see Selena and excited to meet her mother! The next school we visited is a school operated by Edith, one of our Pushaq Warmi women. 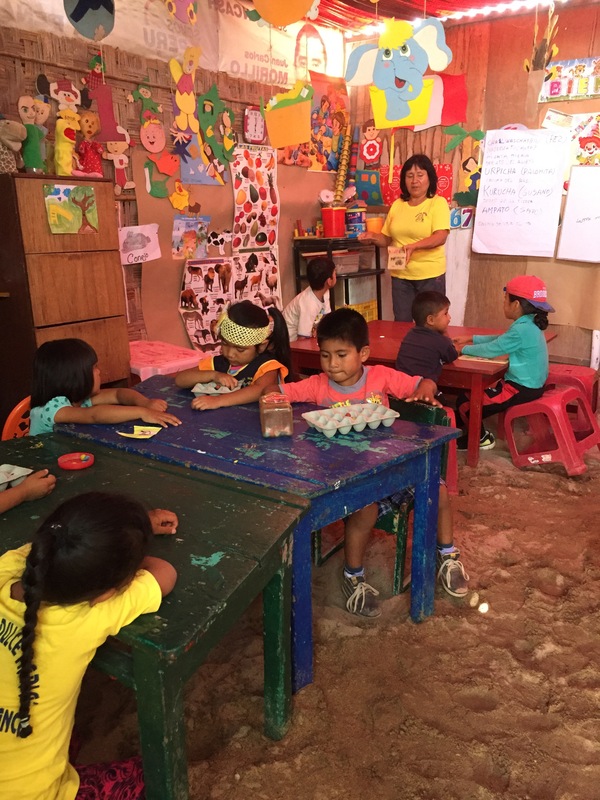 Her classroom is in Nuevo Chimbote. It is a structure she has built herself. It exist within thatch walls and dirt floors, she has child size furniture and organized learning materials. She regularly has 12 children, 5 of those children will be rising to primary school when the next school year begins in March. Both of these classrooms have the most important resource in an early childhood classroom, a caring compassionate teacher. Mari and Edith welcome Selena and the demonstration lessons she provides. They are open to suggestions and eager to attend workshops and try out new ideas. 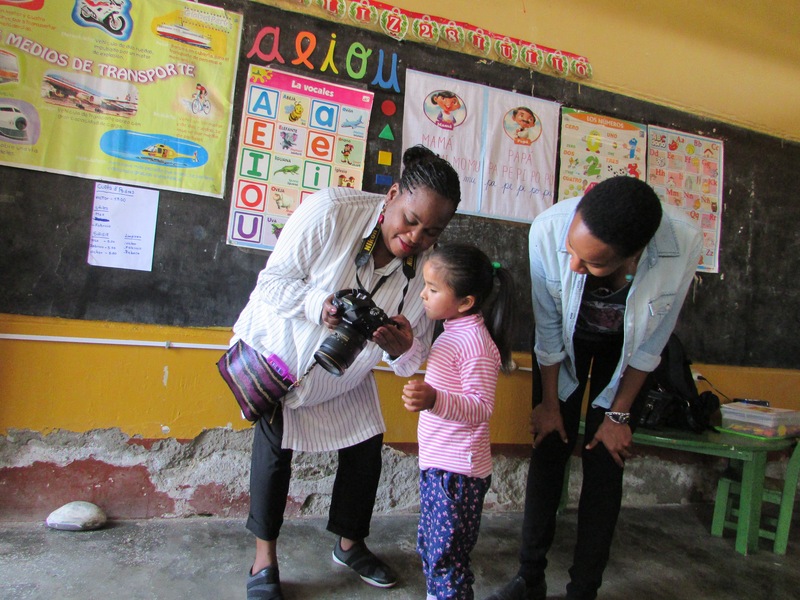 We look forward to continuing our partnership with the early childhood education programs in the Chimbote area. Early Sunday morning the team was met by Anne Catherine Mora, WGC field staff in Chimbote, to walk us to Radio Santo Domingo station. We were met by Sandra and Rosalia of Pushaq Warmi and warmly greeted. Eager to start the show, Sandra gave us an overview of the format, who would speak in what order and topics to be addressed. Kyra Loehnis, nutrition graduate student, had wisely asked ahead of time and was prepared with her answers and notes in Spanish. Kyra answered questions about nutrition issues in Chimbote, specific to sugar and protein in one’s diet. She was followed by Dr. Tomas Uribe who transitioned from he topic of nutrition and its relation to healthy teeth. He spoke of the need to get regular check ups and avoid sugars in young children’s diet to create lifelong dental habits. Both Rosalia and Sandra had questions about dental health which added to the conversation. Finally, Fr. Clemente commented on his impressions of the community here in Chimbote and his activities since arriving. As we returned to our hotel, we walked through the Plaza de Armas where marching corps were lining up and bands began to play. It was all in celebration of Chimbote’s 110the anniversary as a municipality. Later in the day we enjoyed a delicious lunch with the Incarnate Word Missionaries and the CCVI sisters in Chimbote, Hermanas, Leonila, Hirayda, Sophie, Lourdes and Mirella. Lunch at La Fontana is always a treat because it is the place with the most greenery in all of Chimbote, that we have ever seen. Food was typical Peruvian, cuy, ceviche, fish etc. Drinks were typical also, pisco, Cuzquena beer and lemonade. We enjoyed socializing and spending the time getting to know each other. The weather combined with the company made for a perfect Sunday outing. The day started with Fr Clemente saying Mass at the house of the CCVI sisters. It was a wonderful start to the trip as we reflected on the daily gospel and our purpose here. 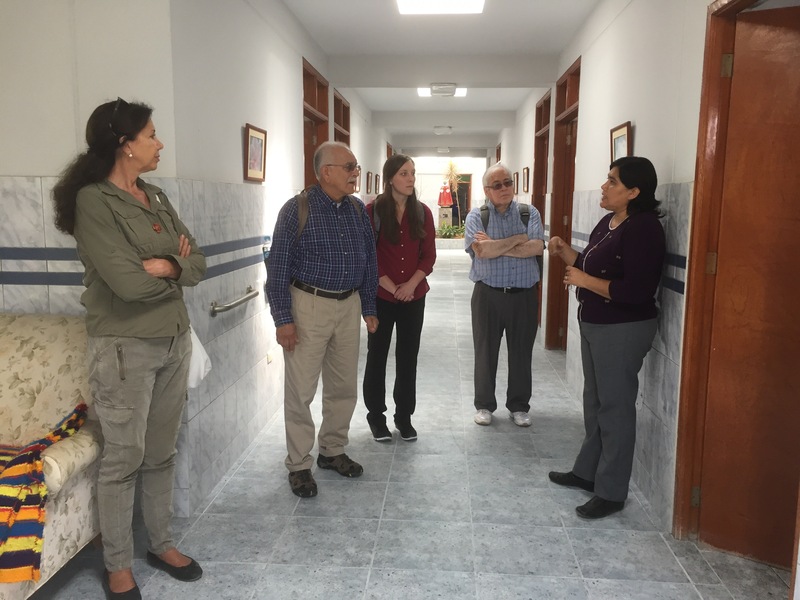 The group then followed Hermana Mirella to the Hospicio. She gave a tour and explained the updates of the Sistema de Salud. Then the afternoon was spent preparing for the workshops tomorrow. The bulk of the workshops will be during the day from 9a – 3p, definitely a busy day. 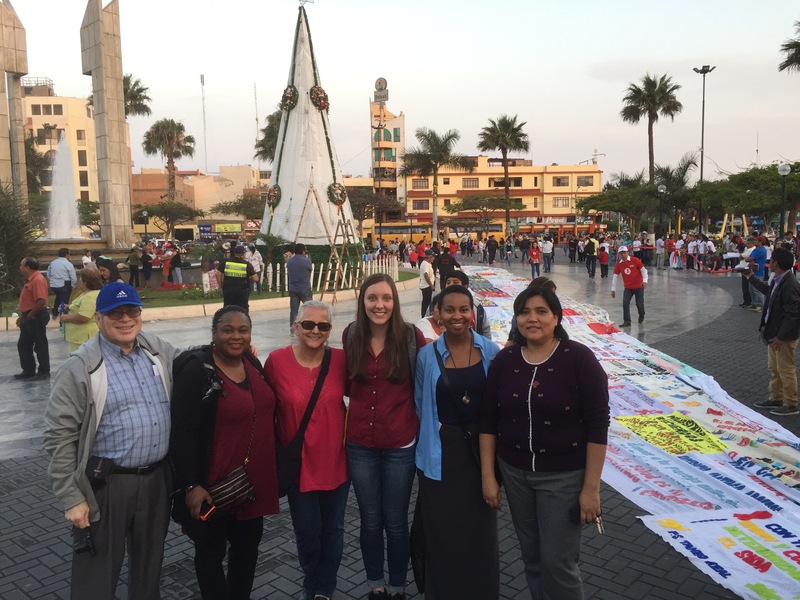 Before dinner we took a walk to the plaza where we discovered it was World AIDS Awareness day. The community hospital laid out their AIDS quilt and had an uplifting dance performance. It was a fitting end to our day as it reminded us of the mission of the CCVIs to serve the community during healthcare crisis and beyond. The day ended with dinner at Mar y Luna with the women of Pushaq Warmi. 23 of us sat together and caught up on family and friends. It was a wonderful end to a busy day. Although tomorrow promises to be even busier! 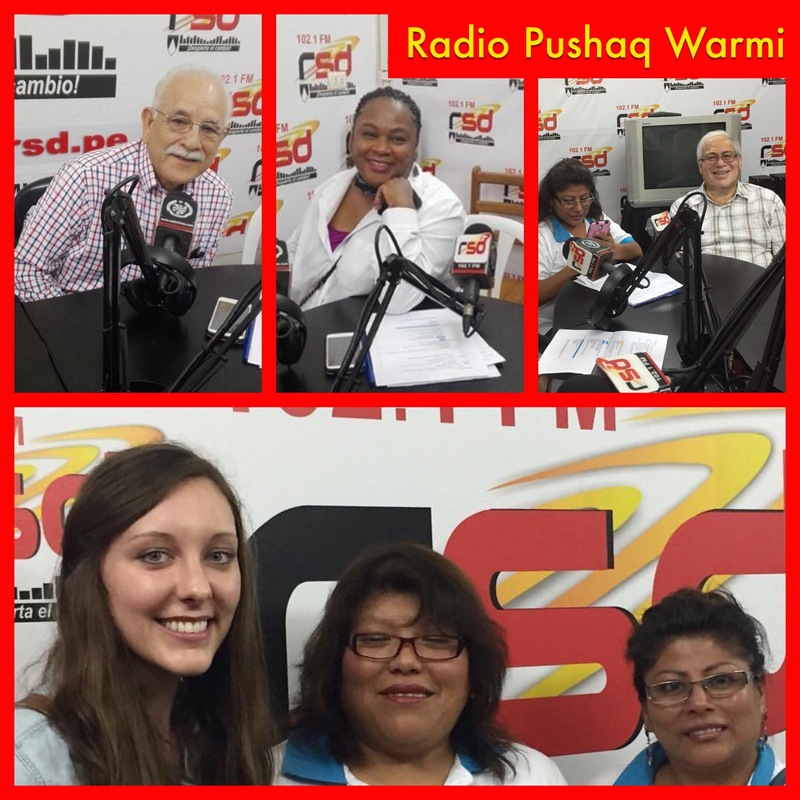 Immersion travelers arrive in Peru! The WGC Peru Immersion trip team has arrived safe and sound. It was a joy being reunited with the Incarnate Word Missionary, Selena Mitchell, who works on our community projects here. She was in Lima completing her residency status paperwork. It was extra joyful for traveler Clara Mitchell to meet up so early with her daughter! Day 1 was spent running errands in Lima, exchanging money, setting local phones – and of course grabbing a great meal; that first plate of ceviche is always so good. Early the next day, Wednesday, we boarded the bus to Chimbote. The daytime bus is great to take to see the glorious coastline of Peru, which you get to see plenty of during the 7 hour ride. We arrived and checked into Hotel Vertiz at about 8pm. We shared quick introductions with other Incarnate Word missionaries, Diane, Mark, and Juan. Then settled in for a good rest. Tomorrow will start early!